So you’ve got a paint chip on your car door, hood, roof or elsewhere and you want to fix it before it quickly becomes a rusty paint chip! Paint chip repair is easy to do yourself with an automotive touch up paint pen or brush. As long as you use touch up paint that matches your car color, and allow the layers to dry between coats, you can repair those chips inexpensively at home. To begin your paint chip repair, first determine how many chips there are and how large they are. Determine if your auto paint is metallic. Find your car’s color code so you can make sure to use the touch up paint that matches. If your car paint is non-metallic, and there are only a couple chips smaller than pencil erasers (about a quarter inch diameter), we recommend using a touch up paint pen. We have found the paint pens are the easiest to use on small car paint chip repair jobs. If the chip(s) are larger than a pencil eraser, but smaller than a dime, use a touch up paint brush for the best chip touch up results on non-metallic paint. Car paint chip repair on areas larger than a pencil eraser or dime with a touch up pen or brush will result in an uneven auto paint job. For a DIY car paint chip repair job on metallic paint or chips larger than a dime, you will want to use automotive spray paint. When you apply metallic car paint with a touch up pen or brush, the metallic flake in the paint will not lay down correctly. Even if there is a perfect paint match, the paint chip repair will look darker. Save yourself the trouble and use an automotive spray paint can for larger areas! 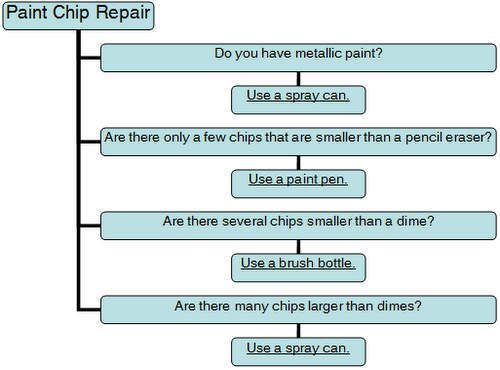 Use this flowchart to select touch up paint for your paint chip repair. Now that you have found your color code and determined which touch up product to use, there are just a couple other items to add to your car paint chip repair kit. These items will help clean and prepare the chipped paint for touch up, seal it, and help it blend with your car’s paint. Before starting a car paint chip repair, you want to make sure the area is clean and clear of wax and grease. Clean with a gentle water and soap solution, and include grease and wax remover in your touch up paint order. 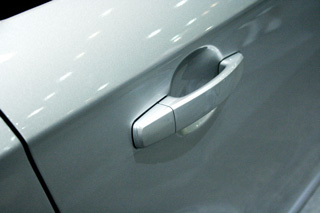 If the chip goes through all the layers of your auto paint, exposing the unpainted surface, auto paint primer is needed. Primer adheres to unpainted surfaces and will get the touch up paint to stick for your paint chip repair. If you need to fill deep scratches, use several coats of primer and gradually build the surface up. If you are priming a flexible surface like a plastic bumper, using spray paint, or touching up non-metallic paint, order SEM Adhesion Promoter to allow the primer to properly stick. After applying touch up paint, use paint chip repair clearcoat to seal the repaired chip and so you can later polish the area. Apply several coats of clearcoat, allowing each to dry before applying the next. Car paint chip repair rubbing compound is used to polish your touched up car paint so it comes out nice and glossy like the original paint. Having some automotive lacquer thinner on hand is a great idea in case any automotive paint gets on your skin, or you make a mistake. It is also good for keeping a paint pen nib (tip) clean, and can be used to thin your paint if necessary. Make sure to only order automotive lacquer thinner, as regular lacquer thinner will not work for your paint chip repair. The directions for paint pens, brush bottles, and spray cans are different, but the same general principles apply. Find more detailed touch up paint instructions here. After cleaning, de-greasing & de-waxing, and priming an auto paint chip, you are ready to apply touch up paint. Auto paint chip repair works best when several layers of touch up paint are used. Allow each layer to dry before applying the next. Wait at least overnight before applying clearcoat over the touch up paint. Chip removed after car paint chip repair! By ordering touch up paint that matches your car color (we guarantee our customers a color match), you can get rid of those paint chips. You will save hundreds of dollars on car paint chip repair cost by doing it yourself. By ordering our top quality touch up paint products and following the basic directions for paint chip repair, rust will not happen and your car will look great again! Find your color now, and get your paint chip repair started.